For most of human history including much of the 20th century, insufficient food was the greatest nutritional challenge. To tackle this, government sought to stimulate the production and distribution of as much inexpensive food as possible, in particular starchy (high carbohydrate) staple commodities and their shelf stable processed products. At the time, a global pandemic of obesity and chronic diseases from the widespread availability of inexpensive, unhealthy food was inconceivable. The relatively recent rise of diet related chronic diseases including obesity, type 2 diabetes, cardiovascular diseases, and several cancers is at least partly a byproduct of these historical approaches and the responses of industry and consumers. A separate article in this series reviews the trends in nutrition science over this period,1 which have slowly shifted focus from undernutrition defined by calories and micronutrient deficiency to food based diet patterns and overall health effects of the food supply. Even with the unprecedented rise in diet related chronic diseases, government policies have continued to emphasise agricultural production of staple commodities and support for the food industry motivated by conventional perspectives on food security, economics, and trade. While undernutrition has improved with government supported systems changes such as agricultural development and fortification programmes,1 government has tended to use educational policy measures directed at individuals in response to the rise in chronic diseases. Such measures aim to influence diet quality by emphasising personal responsibility and choice through dietary guidelines, food labels, menu labelling, and clinical counselling. Uncoordinated, these many influences are powerful and are nearly insurmountable barriers to making healthy dietary choices for many people worldwide. They can introduce health inequities, and sustain or deepen existing ones. However, with thoughtful, evidence informed policy, each of these factors also provides an opportunity for governments to support improvements in diets, health, wellbeing, and equity. Based on advances in behavioural and policy science, we review strategies and approaches that governments can use to directly improve nutrition. We appreciate that other nutrition policy frameworks have been considered.567 We focus on a broad range of interventions and nutrition policies and discuss their strengths, limitations, uncertainties, and recommendations. Governments can use a spectrum of policies from voluntary to mandatory. These include a bill (proposed law), law/act/statute (approved by legislative and executive branches), agency implementation (interpretation, application, regulation), court decision, guideline (recommendation, not mandatory), or directive (internal to an institution). For the different government policy actions, we present a summary of their strengths, limitations, uncertainties, and recommendations (table 1). Implementation of policy actions must be accompanied by systematic surveillance and evaluation to assess progress and guide further efforts. Some key findings can be highlighted. For example, population education and point-of-purchase labelling are widely and increasingly used. Such “soft” policies place most responsibility on the individual consumer, with which industry is often more comfortable. The effectiveness of such policies on behaviour change overall and in specific population subgroups has been variable and they may have smaller effects in marginalised groups.3347980 However, such approaches can also promote industry reformulations, which may have an important effect on longer term health beyond immediate consumer behaviour.34 Overall, such approaches can be valuable as part of a broader, multicomponent government food and nutrition strategy. In contrast to education and information, fiscal incentives and disincentives aimed at consumers, producers, and retailers have more consistent evidence of effectiveness.234567 Disincentives can include excise or sales taxes on unhealthy items such as sugar sweetened beverages and junk food383940 or removal of industry tax benefits for development and marketing of unhealthy products. Disincentives on specific foods can be politically difficult, however, the rapid international expansion of taxes on sugar sweetened beverages shows the growing acceptance of this approach.81 Such taxes can be financially regressive for lower income individuals, but progressive because of benefits to nutrition and health. To reduce financial regressivity and increase the health effect, tax revenues can be used for other health promotion strategies including retail, manufacturing, or agricultural incentives to reduce the price of healthier food products.4142 Rather than being punitive, economic incentives and disincentives “normalise” the market by partly bringing the prices of different foods closer to their true societal cost. Schools and worksites are natural and complementary settings for effective nutrition policies.234567 In schools, after school, and early childcare programmes, government should promote nutrition standards for both onsite meals and competitive foods as low cost, sustainable interventions—examples include standards in the US, Canada, Mexico, Europe, and New Zealand.49 Free or low price provision of fruits and vegetables, farm to school programmes, and school gardens are also promising strategies, although long term effects and cost-benefits are not yet rigorously evaluated. Worksite wellness programmes can not only improve health but also lower costs and increase productivity. In one analysis, every $1 spent on worksite wellness programming was estimated to generate about $3.27 in lower medical costs and $2.73 in less absenteeism.55 However, relatively few long term worksite studies have evaluated the effects on diet, few rigorous cost effectiveness data are available, and increased employee turnover reduces the immediate incentives to businesses to invest in the health of their employees.34 Governments should invest in their own employee worksite wellness programming and pursue policies, such as guidelines and tax incentives, to promote the implementation and evaluation by private employers of worksite efforts for healthier eating. The media and policy makers have increasingly focused on the local food environment, such as clustering of fast food sellers around schools71 and absence of supermarkets in many neighbourhoods (termed “food deserts”).72 However, the actual cause and effect of many of the observed cross sectional relationships and the appropriate ways to characterise the complex facets of availability and accessibility are poorly characterised.23456773 Further investigation including implementation and evaluation research is needed to allow the development of more concrete recommendations on how to improve the local food environment. Modern nutritional science is young, especially in relation to the risk of the main chronic diseases.186 Strong government funding for basic nutrition and applied research and innovation is essential to continue to develop evidence based priorities for dietary policies. Areas for investigation in the next decade, for example, include basic molecular pathways; diet-microbiome-host interactions; individual fatty acids and their lipid derivatives; prebiotics, probiotics, and fermentation; phenols and other bioactive compounds; personalised nutrition; and nutrition data (“big data”). Government funding should also make applied research a priority, including new technologies for nutritional assessment and behaviour change, and policy implementation and evaluation. Local and national governments have important roles in bringing healthier food and food security to their populations. However, the path from knowledge to effective action requires capacity in several areas. To our knowledge no country has implemented a full range of updated, comprehensive, and evidence informed strategies to encourage a healthier and more equitable food system (table 1). Given the remarkable health and economic burden of diet related illness and the need for multistakeholder solutions, a coordinated national food and nutrition policy strategy should be a priority for all governments. Government must have appropriate knowledge to translate evidence into policy action. This includes an evidence based assessment of what defines a healthy diet; an understanding of diet related health and risk distributions overall and in at-risk subpopulations; analyses of how poor diet affects non-health sectors such as private businesses or the military; and consideration of environmental and societal values such as sustainability, equity, and justice. Insufficient awareness of policy makers of these factors can be compounded by evolving science and conflicting media messages. For example, some policy strategies continue to emphasise reduction in total fat, total saturated fat, or total calories, rather than food type and quality, processing methods, additives, and diet patterns.18889New metrics are needed that allow the healthiness of food products to be compared on multiple nutrient criteria.37 In addition, tackling obesity is sometimes seen as the only goal of nutrition policy and programming, rather than improved diet quality and overall health and wellbeing. The evidence to support policy interventions is also different from that for interventions delivered to individuals.234567 Interventions on high risk individuals can often be studied in randomised placebo controlled trials; in contrast, policy interventions on populations often cannot. Thus, predictive modelling, observational, quasi-experimental, and interventional studies, and surveillance data must feature more heavily in the standards of evidence required for policy change. Government must have the capacity to intervene. This includes having an evidence informed plan, access to technical experts for implementation and evaluation, and adequate resources and authority to act in the required areas. For many governments, developing a comprehensive nutritional policy will be new and unfamiliar, and require acknowledgement of certain limitations of the current system. The expertise to combine and phase different policy approaches can be lacking. Jurisdiction and funding for different aspects of policies may be spread across government sectors and ministries, which may share unequally the costs and benefits. Budgets for technical policy work on nutrition are often tied to resources allocated for the prevention of chronic diseases, which is underfinanced given their health and economic burden. Surveillance systems for monitoring and evaluating nutrition trends and disparities are under resourced. For some promising policy actions, relevant data demonstrating the links between food policies and health, healthcare costs, disparities, and economic problems are often unavailable to policy makers at the right time or in the right format for policy action. Government must have the will to act and the governance and partnerships to support action. This requires support from civil society and relevant private and other non-government actors to implement and sustain appropriate policies. Political willingness to act can be undermined by several factors. For example, factors driving government food production policy (eg, employment, short term business profits, and international competition) may be different from those driving nutrition policy (eg, health and healthcare costs). Although dietary shifts can have rapid effects on health,90919293 the perception that dietary interventions require long periods to achieve benefits may not coincide with political and budget cycles. Public opinion may also not support policies seen as intrusive.94 Identified dietary priorities may not match public priorities and sentiment, nor agency authority for action. Industry opposition can be a major barrier, including political lobbying and marketing campaigns to fight policies they consider unfavourable.95 When policies are passed, lack of implementation because of limited resources, management, and accountability can greatly limit their effect,96 as in the case of school food standards in Mexico or quality standards to limit industrial trans fats in India. Other stakeholders should promote, facilitate, and complement government policy efforts.25219798. Academia should prioritise research on optimal dietary targets and cost effective policies; monitor and evaluate health indicators and policy outcomes; engage with communities, advocacy groups, the media, business, and policy makers; and inform and evaluate government and industry efforts. Health systems, clinicians, and insurers should implement strategies on patient behaviour change; advocate for broad changes in health systems to support these efforts; and engage with local communities. Employers, communities, schools, hospitals, and religious congregations should implement organisational strategies for healthier eating. Advocacy groups should partner with scientists to disseminate best practices and hold government and industry accountable for meaningful action. Large multinational companies frequently have a great influence because of their economic power, government lobbying, and communication and marketing resources. Unclear or variably enforced government provisions on conflicts of interest can further increase industry influence. More directly, certain food companies have actively opposed policies about healthier foods,95 especially in low and middle income countries.96 Because multiple actors must be involved in effective nutrition policies and programmes, transparent rules of engagement are needed for public-private interactions (box 2). The food industry must be a facilitator for, not a barrier to, healthy food policies and use their expertise, scale, innovation, and marketing to develop, distribute, and market healthier foods, and create transparent, sincere partnerships with academics, advocacy groups, and government. 87100101 To achieve this, the food industry’s ultimate success ought to be linked to the distribution of healthy, optimally processed foods in a sustainable, equitable, and profitable way. Engagement with multiple actors is essential for the implementation of effective policies and programmes to tackle obesity and other chronic diseases. Clear rules are needed to manage conflicts of interest. Corresponding risks are neither assessed nor managed before or during such public-private interactions. Need for regulations on lobbying. Lobbying strategies can greatly affect health policy decisions.104 In many countries, lobbying activities and corporate financing of politicians and political parties are loosely regulated. Strong regulations on transparency and activities are needed to maintain effective, unbiased policy making. Need for standards on public-private partnership. Given widespread recommendations for public-private alliances and partnerships to support the achievement of global health and development goals, governance of public-private partnerships is important to ensure that efforts to improve food and nutrition are in line with ethical, transparency, and accountability principles. For instance, the food and beverage industry should not participate in decision making on the design, implementation, or evaluation of obesity prevention policies. Their voice should be heard but decisions should be made by those without commercial interests. Need for more than self regulation. Industry self regulation is not sufficient to advance public health goals. Additional government regulation and standards are important to enforce the implementation of health related food and nutrition policies. The case studies also highlight the need for scientific evidence free of conflicts of interest. Particularly in the cases of sugar sweetened beverages and junk foods, commissioning studies with strong ties to or funding from the food and beverage industry is a risk.105 Independent, peer reviewed scientific research is important to help inform policy making with the best available evidence. When industry does play a role in research studies, the involvement should be transparent. Analysis of these case studies indicates a need to address conflict of interest and industry influence in health and nutrition policy making. WHO recently published draft guidance for the prevention and management of conflicts of interest in policy development and implementation of national nutrition programmes.106 Governments, academia and civil society all play an important role. In addition, further research is needed on how to identify, study, and minimise conflicts of interest in food and nutrition policy. Given the scale of the problem and the multinational nature of the food industry, global public health efforts can complement national and local government activities. International economic and political institutions, including the World Bank, United Nations, and World Trade Organisation, must play a more assertive role. Actions should include developing and measuring adherence to nutrition policy standards; coordinating efforts of member country; assisting governments as needed with design, implementation, and evaluation of food policies; bringing stakeholders together including global agribusiness, restaurant chains, and food manufacturers; and providing a countervailing force to multi-national food industry lobbying. 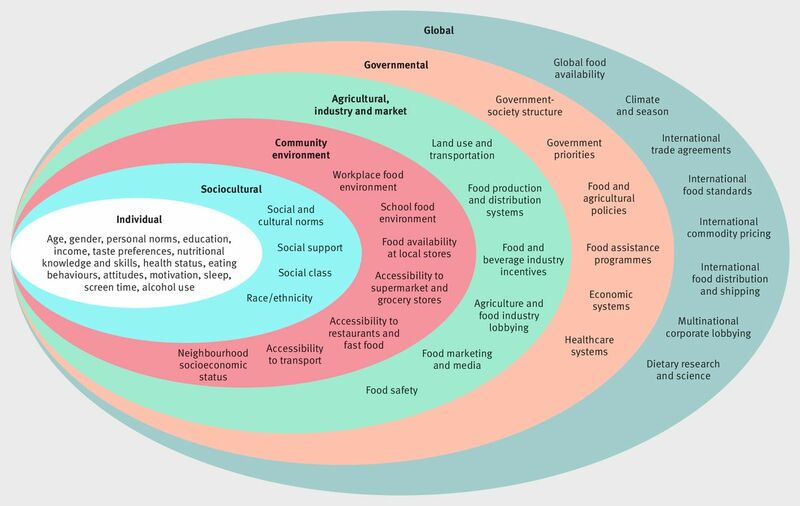 Because multisectoral approaches are necessary to create healthier food systems,5 governments should actively develop and implement policies to promote strategic and sustained change. We recommend several specific government roles and actions (box 3). For each, governments should assess whether the implemented strategies have the intended effects, identify and tackle disparities, and detect unintended consequences. This information should be made accessible to the public, academia, and other organisations. The development and implementation of effective nutrition policies by governments have been hindered in the past by several factors, including insufficient knowledge, capacity, and will. Action and advocacy by many stakeholders are needed to overcome these barriers. Past successes that can point the way forward include effective public health approaches to complex problems such as tobacco use, motor vehicle crashes, and occupational safety. These have been achieved through a combination of scientific progress, public awareness and advocacy, consumer demand, industry innovation, government regulation, and cultural change. These successes provide a template for a healthier food system, that is: address the consumer, the product (agricultural commodities, foods, and beverages), the environment (retailers, cafeterias, and restaurants), and the culture (unhealthy eating, and marketing). To be successful, broad alliances are often required to maintain pressure, provide sound data, and bring about the desire for progress. Strong government policy is crucial to achieve a healthy, profitable, equitable, and sustainable food system that benefits all. Contributors and sources: DM conceived the paper and is the guarantor. All authors contributed to drafting the manuscript and critical revision of the manuscript for important intellectual content, and approved the final manuscript. The authors selected the literature for inclusion in this manuscript based on their own expertise and knowledge, discussions with colleagues, and editorial and reviewer comments. Competing interests: All authors have read and understood BMJ policy on declaration of interests and declare funding from the National Institutes of Health, NHLBI (R01 HL130735). The funders had no role in the design or conduct of the study; collection, management, analysis, or interpretation of the data; preparation, review, or approval of the manuscript; or decision to submit the manuscript for publication. DM reports personal fees from Acasti Pharma, GOED, DSM, Nutrition Impact, Pollock Communications, Bunge, Indigo Agriculture, and Amarin; scientific advisory board, Omada Health, Elysium Health, and DayTwo; and chapter royalties from UpToDate (not related to this work). JAR reports personal fees from Tres Montes Lucchetti, not related to this work.
. History of modern nutrition science–implications for current research, dietary guidelines, and food policy. BMJ2018;361:k2392.
. Carbonating the world: the marketing and health impact of sugar drinks in low- and middle-income countries.Center for Science in the Public Interest, 2016.
. Bringing agriculture to the table: how agriculture and food can play a role in preventing chronic disease.The Chicago Council on Global Affairs, 2011.
. Sustainable diets.Routledge Earthscan, 2017. U.S. Department of Agriculture, U.S. Department of Health and Human Services. 2015-2020 Dietary Guidelines for Americans. Secondary 2015-2020 Dietary Guidelines for Americans 2015. https://health.gov/dietaryguidelines/2015/guidelines/. , eds. The North Karelia Project: 20 years results and experiences.National Public Health Institute and World Health Organization Regional Office for Europe, 1995. Preparation and use of food-based dietary guidelines: Report of a Joint FAO/WHO Consultation.WHO,1998. Dietary Guidelines Advisory Committee. Scientific Report of the 2015 Dietary Guidelines Advisory Committee. Secondary Scientific Report of the 2015 Dietary Guidelines Advisory Committee 2015. http://www.health.gov/dietaryguidelines/2015-scientific-report/.
. Effectiveness of point-of-purchase labeling on dietary behaviors and nutrient contents of foods: A systemic review and meta-analysis (abstract). Circulation2015;131(Suppl 1):AP323-AP23. Nutrisavings. The Nutrisavings scoring system. 2016. http://media.nutrisavings.com/Print/white-paper-v4.pdf. Fat economics: Nutrition, health and economic policy.Oxford University Press, 2009doi:10.1093/acprof:oso/9780199213856.001.0001 .
. The Food Industry, Diet, Physical Activity and Health: a review of reported commitments and practice of 25 of the world’s largest food companies. Report to the World Health Organization.City University Centre for Food Policy, 2006. National Institute of Diabetes and Digestive and Kidney Diseases, National Institutes of Health. Diabetes Prevention Program (DPP). Secondary Diabetes Prevention Program (DPP). https://www.niddk.nih.gov/about-niddk/research-areas/diabetes/diabetes-prevention-program-dpp/Pages/default.aspx. Wave W. Wholesome wave: how we work - produce prescriptions. 2017. https://www.wholesomewave.org/how-we-work/produce-prescriptions (accessed April 4, 2018).
. Challenges and opportunities for change in food marketing to children and youth: Workshop summary.The National Academies Press, 2013. World Health Organization. A framework for implementing the set of recommendations on the marketing of foods and non-alcoholic beverages to children. 2012. http://www.who.int/dietphysicalactivity/MarketingFramework2012.pdf . Mayor of London. Mayor cracks down on opening of new hot-food takeaways around schools. https://www.london.gov.uk/press-releases/mayoral/mayor-cracks-down-on-new-takeaways-near-schools.Greater London Assembly, 2017.
. Ecological public health: reshaping the conditions for good health.Routledge/Earthscan, 2012.
. Primary prevention of cardiovascular disease with a Mediterranean diet. N Engl J Med2013;368:1279-90. doi:10.1056/NEJMoa1200303 .
. Soda politics: taking on big soda (and winning).Oxford University Press, 2015.
. Promoting cardiovascular health in the developing world: a critical challenge to achieve global health.The National Academies Press, 2010.
. Public health and the food and drinks industry: The governance and ethics of interaction. Lessons from research, policy and practice.UK Health Forum, 2018.
. Conclusions. In: Mwatsama M, ed. Public health and the food and drinks industry: The governance and ethics of interaction. Lessons from research, policy and practice.UK Health Forum, 2018:145-8.
. The development of a national obesity and diabetes prevention and control strategy in Mexico: actors, actions and conflicts of interest. In: Mwatsama M, ed. Public health and the food and drinks industry: The governance and ethics of interaction. Lessons from research, policy and practice.UK Health Forum, 2018:18-30.
. Sugar-sweetened beverages, non-communicable diseases and the limits of self-regulation in Fiji. In: Mwatsama M, ed. Public health and the food and drinks industry: The governance and ethics of interaction. Lessons from research, policy and practice.UK Health Forum, 2018:39-45.
. From participation to power: how the sugar- sweetened beverage industry shapes policy through multi-stakeholder coalitions. In: Mwatsama M, ed.UK Health Forum, 2018:102-9.
. Conflicting goals and weakened actions: lessons learned from the political process of increasing sugar-sweetened beverage taxation in Chile. In: Mwatsama M, ed. Public health and the food and drinks industry: The governance and ethics of interaction. Lessons from research, policy and practice.UK Health Forum, 2018:31-8.
. Designing a front-of-package labelling system to encourage healthier beverage choices in Guatemala. In: Mwatsama M, ed. Public health and the food and drinks industry: The governance and ethics of interaction. Lessons from research, policy and practice.UK Health Forum, 2018:89-95.
. Report by the Director-General. Safeguarding against possible conflicts of interest in nutrition programmes: Draft approach for the prevention and management of conflicts of interest in the policy development and implementation of nutrition programmes at country level.WHO, 2017.